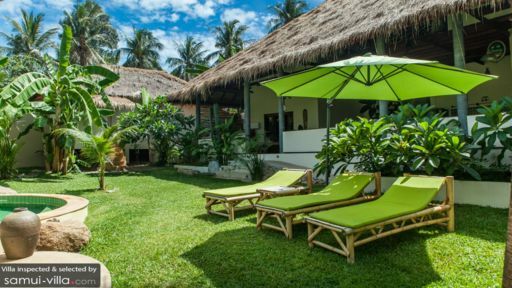 With 10 bedrooms spread out over two individual properties, Baan Thamarchat is a great bet for large group retreats in Koh Phangan. It boasts all the essentials that you’d expect of a luxury property, like immaculate service, beautiful living spaces and modern amenities. The villa’s emerald surroundings, close proximity to the beach and gorgeous pavilions crafted out of natural materials add on to its tropical charms. A total of 10 bedrooms are spread out across two standalone villas. Baan Ya Kha houses 10 guests in five bedrooms. Each room feels warm and cosy thanks to its soothing cream hues, and come fitted with fans and air conditioners. The rooms are spread out across three bungalows: the first bungalow features two bedrooms with king beds and a bathroom, the second features two bedrooms (one with king bed and the other outfitted with twin singles) and a bathroom and the third contains a bedroom with private en suite. The remaining five bedrooms are set in Baan Yai. Three of the rooms are set on the ground floor; two are outfitted with a king bed, air conditioner, TV and private en suite while the third features twin beds, air conditioners and a TV set. The upper floor bedroom boasts king beds, sofas, air conditioned interiors, fans and smart TV sets. The media lounge may be converted into a sixth bedroom to house two extra guests. Make a splash in one of the two swimming pools. The first, located in Baan Ya Kha, features an indoor-outdoor design. It takes a free form shape, and flows from the garden into the living pavilion. A non-chlorine pool system keeps the waters free of harsh chemicals. Or take a dip in the pool at Baan Yai. Just like the swimming pool at Baan Ya Kha, it boasts a free form shape, and comes equipped with a child-friendly shallow wading area and pool benches. Both outdoor compounds are spacious and inviting, offer recliners and are set against a picture-perfect environment. Each standalone villa features capacious living areas with indoor-outdoor designs and an earthy colour scheme. At Baan Ya Kha, the living spaces wrap around the pool and outdoor compound. The living area feels bright and airy, and boasts a lounge, kitchen and dining area set in an open plan layout. Recline against the L-shaped sofa for a siesta, whip up a snack or cocktail in the open kitchen or tuck into a meal while seated at the communal dining bench. Baan Yai’s living spaces differ slightly in its decor - while its interiors are similarly awash in neutral hues and are built for indoor-outdoor living, the lounge, kitchen and dining area are clustered in one section of the villa away from the bedrooms. There’s also a media room with convertible king sofa and 50-inch flat screen TV; it can also double up as a spare bedroom to accommodate two extra guests. 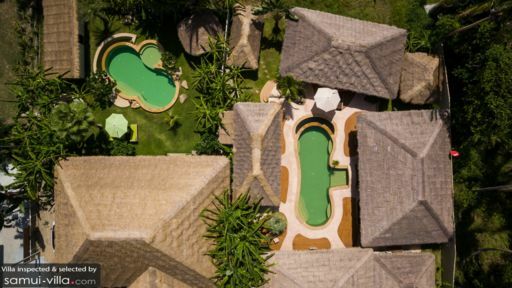 Baan Tharmarchat enjoys all the essentials that come with being a luxury property - there’s daily housekeeping, pool and garden maintenance and CCTVs installed through the compound to keep it secure. Services available at additional cost include: private chef, in-villa spa treatments and Thai cooking classes. 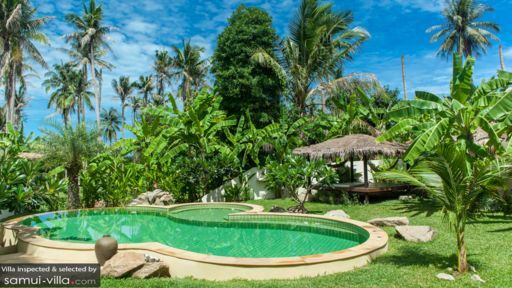 Nestled away in a coconut grove, the property is just a skip away from local amenities and restaurants, and is about 10 minutes’ drive from Thongsala, the main town of Koh Phangan. There’s a 24/7 7-11 store just 200 metres away, and a pharmacy and bakery are easily within reach. Great dining options located just a quick drive away include Romanzo Tropicale, L'Alcôve and Belgian Beer Bar. The nearest beach is just two minutes’ walk from your villa. Its tranquil setting appeals to villa vacationers seeking to spend hours relaxing by the coast, but for a livelier beach ambience, take a 20-25 minutes drive to Haad Rin Beach. As the hotspot in town, the coast comes lined with numerous dining and nightlife options, and is the venue for the island’s monthly Full Moon party. Your villa manager will readily assist with engaging a yoga instructor for private in-villa sessions. But if you prefer the vibes and setting of a group session, drop-in classes are available at Orion Healing Center (three minutes’ drive), Gaia Yogashala Koh Phangan (five minutes’ drive), Samma Karuna Yoga (seven minutes’ drive) and The Yoga Retreat (12 minutes’ drive).